by allowing rapid changeovers between cutting and marking operations by recalling presaved programs. Using an automated gas device such as this also can improve parts life as optimum plasma-cutting parameters are maintained without setup errors. The control consists of three independent modules. The first, the TSC-3000, reportedly offers the only touchscreen controller available in the plasma industry, allowing operators to quickly choose one of potentially thousands of stored programs and start cutting by touching the Go button. 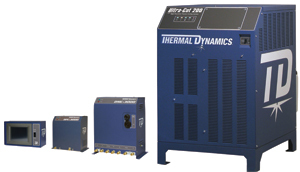 The DMC-3000 functions as the central manifold for all incoming gases. With seven inputs and five outputs, this unit facilitates which gas will be used according to the program selected. A small footprint enables the module to be placed on top of the power supply or mounted to a gantry. The third module, the Digital Pressure Control (DPC-3000), controls gas flow and pressure to optimize cutting. The unit normally ismounted within 4 ft. of the cutting torch to minimize switching time between processes.